SongTabs.com released a new video guitar lesson, now available on YouTube.com, Beth Norman teaches the song Marry You by Bruno Mars. There is only one chord progression and one strumming pattern for the whole song. Beth starts off this easy beginner acoustic guitar lesson by briefly performing the song so you can hear how it sounds. Beth says that to be in the original key you need to use a capo on the third fret. Next Beth goes over the chords that are used for the song as follows; D, Em (E minor) and G. “There is only one chord progression and one strumming pattern for the whole song,” says Norman. 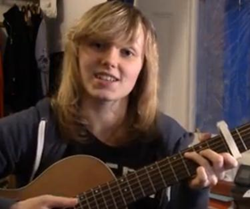 Beth demonstrates the chord progression and strumming pattern as follows; chord progression; D, Em, G and D. Each chord is played for eight beats and the strumming pattern is; down, down, up, up, down, up and counted as; 1, 2, &, 3, 4, &. Finally Norman performs the song so that even the novice guitarist can play along with her. Complete guitar chord charts and guitar TAB’s are available for this easy beginner acoustic guitar lesson at SongTabs.com. A Capo, short for capotasto, which is Italian for “head of fret board,” is a device used on the neck of a fretted instrument to shorten the playable length and raise the pitch. Peter Gene Hernandez, aka Bruno Mars, is an American singer/songwriter, producer, voice actor and choreographer from Honolulu Hawaii. Over the course of his four year career he has won two Grammy Awards and sold over 10 million albums worldwide and 68 million singles, four of which are considered the best selling singles of all time. Mars is considered as one of the most successful solo artists of all time with 5 number one singles on the Billboard Top 100 since the launch of his career in 2010. Started playing the guitar at the age of 15 and started her first band only after 3 months of playing. She put up her first YouTube tutorial video in 2009 and has gained 40,000 subscribers and over 8 million views and counting.